If you are looking for an evening of pure entertainment look no further. “39 Steps” will charm you and leave you dazzled by good old-fashioned stagecraft. If you need social, political, or philosophical depth to make it worth your while to venture out, you need not read further. “39 Steps” will leave you pondering the rapid fire and precise timing of the four equally talented actors. You will not be debating the meaning of life as you walk to your car. This is the rare play you can take a sophisticated child or grandchild to, knowing you will both enjoy it and you will not find yourself cringing over language or innuendo. It is adult entertainment that can be shared. But be warned, it is the sort of entertainment that could make a child dream of a life on stage. The silent films of Buster Keaton and Charlie Chaplin still leave modern audiences gasping. They executed their own stunts and conveyed significance with simple yet eloquent gestures. The cast of “39 Steps” brings the best of their work to mind. According to the program notes, there are 100 characters and the four actors portray them all, without regard to gender. There is rapid, before your eyes, costume changing; a set made up primarily of moveable parts used in ingenious ways; terrific stunts; and it is all topped off with rapid-fire, tongue-in-cheek dialogue. A veritable blend of Chaplin, Monty Python, and Faulty Towers, with a little of who-knows-what thrown in. It is hard to believe that the original London cast could offer an improvement on this touring group. The fascinating part is that 60 percent of the dialogue is lifted directly from Hitchcock’s 1935 film, but to very different effect. One of Hitchcock’s signatures was to insert dabs of wry humor while laying out juicy mysteries with surprises matched only by Daphne Dumaurier. 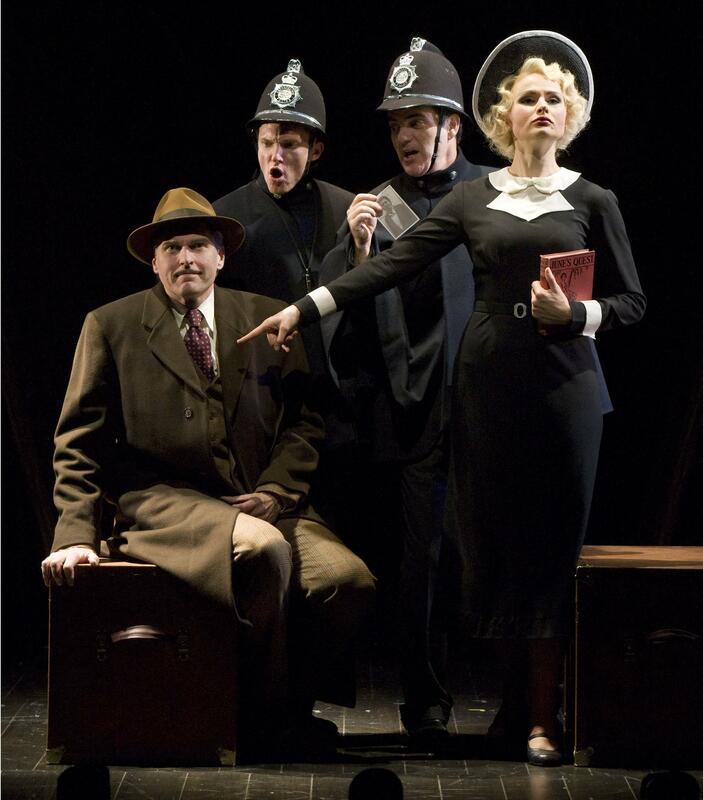 This stage version of “39 Steps” tells the original story but is funny … plain and simple. There are many references to other Hitchcock films, plus some outside references as well. But here is the good part, unlike some recent films that rely on audiences having extensive knowledge of current culture or a specific part of the entertainment world, you will not feel as though you are missing the point if you do not catch all the allusions. I know; I missed many, as I am not an old-film connoisseur, yet I was thoroughly charmed and enjoyed the ones I got. Briefly, the story is classic intrigue. An upper class, immaculately besuited, 36-year-old Londoner sits in a leather chair in his newly acquired flat, reflecting on the lack of women and meaning in his life. He goes to the theater and is seduced by a sinisterly accented woman – a spy by all accounts — her every comment oozes danger. He takes her back to his flat. He (to be a gentleman) sleeps in his chair while (he would say whilst) he gives her his bed, despite her attempt to lure him to the bedroom. She is mysteriously killed by a huge knife that is thrown through the window and lodges in her back as she flings herself across the arms of his aforementioned chair. Fearing he will be charged with the murder, he flees police pursuit, engendering a series of adventures and escapades with a little falling in love on the side. As I said, there is nothing profound in “39 Steps,” but it is therapeutically funny, and there is nothing wrong with that. You will never see stagecraft executed with more precision; there is timing that a contemporary dance company could envy. You will rarely see anything more deserving of being billed as theater for all ages. I think Hitchcock would approve of the adaption. And if he would not, I will put myself on the line and say I do.